Paulist Press — The timeless moral teachings of one of the greatest spiritual works ever written, Imitation of Christ by Thomas a’ Kempis, is presented for the first time in an interesting and easy-to-understand manner for young Catholic readers. Like the classic itself, Imitation ofChrist for Children is divided into four sections or chapters, taking the reader on a step-by-step journey into greater intimacy with Jesus Christ, culminating in the sacrament of the Eucharist. Using real-life scenarios, creative projects, and thought-provoking questions, this book is ideal for home or classroom use. Heartwarming, colorful, compelling children’s book suitable for gift-giving. This illustrated adaptation of Thomas a Kempis’ The Imitation of Christ is child-friendly, with short little lessons of one page or less. Ficocelli gets her message across without seeming preachy, and Sabatino’s humorous illustrations keep the important message in a light vein. Although this book is advertised for children, adults who read it with them might find they learn something, too. An incredible resource for families! With her retelling of The Imitation of Christ by Thomas A Kempis, Elizabeth Ficocelli has brought the wonders of this wonderful spiritual classic to a new generation (and their parents!). This is a well thought out, extremely well written synopsis of the main points of the original classic, encouraging families to live out the gift of the Eucharist by following Jesus and living lives as closely linked to his as possible. I frequently pick up a classic, The Imitation of Christ, and when I heard about Elizabeth Ficocelli’s The Imitation of Christ: A Guide for Following Jesus, I purchased one for each of my grandchildren. They are eight and ten, and it makes them feel “grown up” to read something their grandmother is reading. I especially like the introduction….it talks about Thomas A’Kempis: who he is, when he lived and why he wrote the book. Every family should have this book for each child to read and reflect on as they mature. 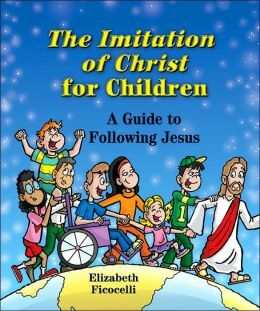 Elizabeth has done an excellent job at writing a guide for kids on how to follow Jesus. A must have in every home!! !